Werribee is a suburb of Melbourne, Victoria, Australia, 32 km south-west of Melbourne's Central Business District, located within the City of Wyndham local government area. 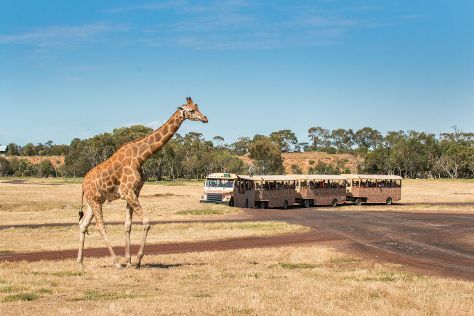 On the 19th (Sun), learn about wildlife with up-close encounters at Werribee Open Range Zoo, learn about all things military at RAAF Museum, and then pick up some local products at Eynesbury Market. Here are some ideas for day two: see the interesting displays at Scienceworks, contemplate the long history of Truganina Explosives Reserve, then take in the architecture and atmosphere at Our Lady Ta' Pinu Shrine, and finally look for gifts at St Anne's Winery. To find reviews, ratings, more things to do, and tourist information, you can read our Werribee trip maker site . Singapore, Singapore to Werribee is an approximately 13-hour flight. You'll lose 2 hours traveling from Singapore to Werribee due to the time zone difference. Expect cooler temperatures when traveling from Singapore in May; daily highs in Werribee reach 20°C and lows reach 9°C. Wrap up your sightseeing on the 20th (Mon) to allow time to drive to Colac. Colac is a small city in the Western District of Victoria, Australia, approximately 150 kilometres south-west of Melbourne on the southern shore of Lake Colac and the surrounding volcanic plains, approximately 40km inland from Bass Strait. On the 21st (Tue), browse the fresh offerings at Jo's Pantry, then stroll around Memorial Square, then take in nature's colorful creations at Colac Botanic Gardens, and finally take in the dramatic natural features at Red Rock. For photos, more things to do, traveler tips, and more tourist information, refer to the Colac road trip planner . You can drive from Werribee to Colac in 1.5 hours. In May in Colac, expect temperatures between 20°C during the day and 8°C at night. Wrap up your sightseeing on the 21st (Tue) early enough to drive to Port Campbell. Port Campbell is a coastal town in Victoria, Australia. Take a break from the city and head to Port Campbell precinct and foreshore and Port Campbell National Park. You'll discover tucked-away gems like The Arch and The Twelve Apostles. There's lots more to do: take some stellar pictures from Loch Ard Gorge, take in the dramatic natural features at London Bridge, and make a trip to Gibsons Steps. 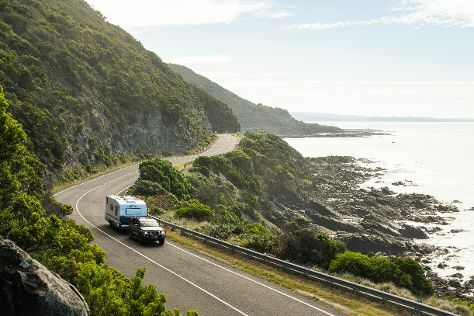 To see more things to do, traveler tips, ratings, and more tourist information, read our Port Campbell online trip itinerary maker . You can drive from Colac to Port Campbell in an hour. Cap off your sightseeing on the 24th (Fri) early enough to go by car to Port Fairy. Port Fairy is a coastal town in south-western Victoria, Australia. Kick off your visit on the 25th (Sat): head off the coast to Griffiths Island, then enjoy the sea views from Griffiths Island Lighthouse, then view the masterpieces at Blarney Books and Art, and finally browse the fresh offerings at PORT FAIRY FARMERS MARKET. On the 26th (Sun), you'll have a packed day of sightseeing: take in the exciting artwork at Whale Bone Studio Arts, steep yourself in history at Port Fairy Historical Society, admire the masterpieces at Wishart Gallery, then identify plant and animal life at Russell Clark Reserve, and finally stroll the grounds of Port Fairy Public Cemetery. Plan a Port Fairy trip in moments using our itinerary builder. Traveling by car from Port Campbell to Port Fairy takes 1.5 hours. Finish up your sightseeing early on the 26th (Sun) so you can go by car to Warrnambool. Warrnambool is a regional centre and former port city on the south-western coast of Victoria, Australia. On the 27th (Mon), explore the landscape on two wheels at Foreshore Promenade, admire the striking features of Warrnambool Breakwater, identify plant and animal life at Thunder point Coastal Reserve, then stroll the grounds of Tower Hill Cemetery, and finally get impressive views of Tower Hill Wildlife Reserve. Here are some ideas for day two: take in nature's colorful creations at Warrnambool Botanic Gardens, then enjoy the sand and surf at Logan's Beach, and then stroll around Lake Pertobe Adventure Playground. To see where to stay, other places to visit, more things to do, and tourist information, read Warrnambool trip builder . Warrnambool is just a short distance from Port Fairy. Finish your sightseeing early on the 28th (Tue) to allow enough time to travel to Lorne. Lorne is a seaside town on Louttit Bay in Victoria, Australia. Kick off your visit on the 29th (Wed): look for gifts at Great Escape Books, visit a coastal fixture at Split Point Lighthouse, take an in-depth tour of Great Ocean Road Story, take in the dramatic scenery at Erskine Falls, then make a trip to Teddy's Lookout, and finally admire the sheer force of Sheoak Falls. Get ready for a full day of sightseeing on the next day: take a peaceful walk through Lorne Beach. For more things to do, reviews, maps, and tourist information, use the Lorne trip maker website . Traveling by combination of train and taxi from Warrnambool to Lorne takes 2.5 hours. Alternatively, you can drive; or take a bus. In May, daytime highs in Lorne are 20°C, while nighttime lows are 8°C. Finish up your sightseeing early on the 30th (Thu) so you can go by car to Torquay. Kick off your visit on the 31st (Fri): admire all the interesting features of The Great Ocean Road, look for gifts at Anglesea Surf Centre, and then tour the pleasant surroundings at Anglesea Bike Park. Get ready for a full day of sightseeing on the 1st (Sat): identify plant and animal life at Point Addis Marine National Park. To find other places to visit, photos, ratings, and more tourist information, go to the Torquay tour planner. Traveling by car from Lorne to Torquay takes an hour. Alternatively, you can take a bus. In May, plan for daily highs up to 20°C, and evening lows to 8°C. On the 2nd (Sun), wrap the sightseeing up by early afternoon so you can travel back home.